After finishing our Alaskan totem poles, Trevor and I were eager to try the last of the twelve activities in the Little Passports Alaska Journal (affiliate link) called "Eat an Igloo." To make the igloo, we mixed Berry Blue Jello and unflavored gelatin. 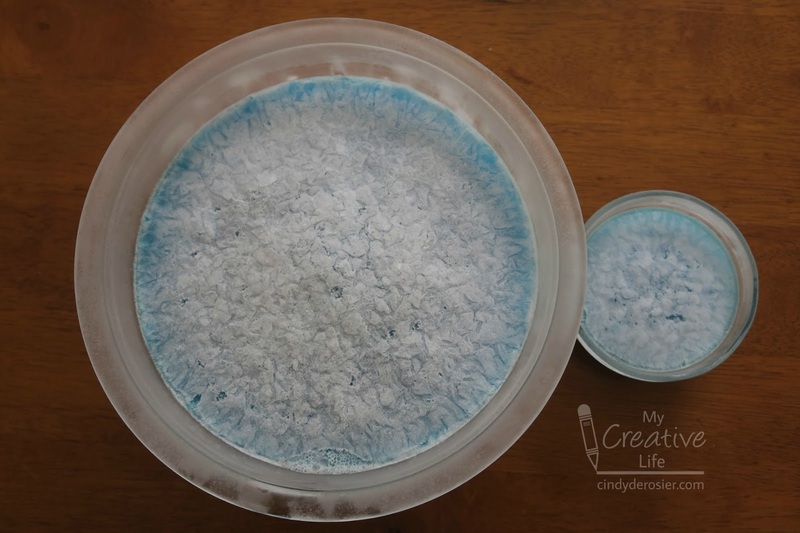 We added water, then poured the Jello into a mixing bowl and a prep bowl that we'd coated with cooking spray. As per the instructions, we put the bowls in the freezer. The instructions clearly state to freeze the Jello for four hours. As soon as the bowls went into the freezer, we left the house for the latest 40-4-Steve adventure and didn't return home until late. When we finally took the bowls out of the freezer, about 24 hours had passed. The Jello was rock-solid, with a thick coat of ice on the surface. Oops. I don't know if the fact that it was frozen solid made a difference (probably yes), but I had the darnedest time trying to remove the Jello from the bowls. While I struggled, Trevor made the cream cheese frosting. Once they were finally free from the bowls, we arranged the semi-circles of Jello on a plate. Then it was time for piping. Trevor has taken a number of cake decorating classes and is decent at piping, but it turns out that piping on frozen Jello is not the same as piping on cake. It's a lot harder. We worked together to find a technique that worked well enough. Here's our finished igloo. Rather than throw out the remaining frosting, we used it to create snow around the base of the igloo. Unfortunately, none of us were particularly enamored with the taste of frosted blue Jello. But the project was really fun. 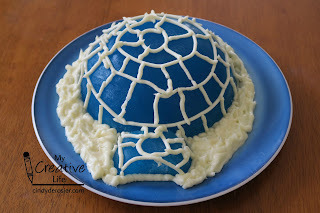 I could see us making something like this again, but using a white cake instead of Jello. As always, I highly recommend Little Passports for cool geography-based projects like this! Bummer that it didn't taste good. It looks great though. LOVE the blue.